There was a lot to celebrate last week when a tide of orange overalls swept into Hills Shire Council. 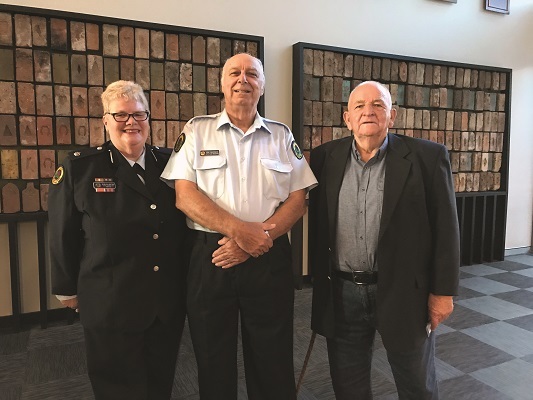 A special function was held to celebrate the 50th anniversary of The Hills State Emergency Services and also thank volunteer members for their service. Keith Grant, 82, was given a 50 year service ward for dedicated service. A teacher, he joined the SES when he moved to Baulkham Hills. “We were fairly new in the area and I wanted to make a contribution, I thought the emergency services was a fine way to do it,” he said. Neil Gall, 76, is the next longest serving member of The Hills SES with 44 years service. “I wanted to get involved in the community. “I was living in North Rocks and read about the SES in the paper. “In those days we only 20 members now there are 150 on the books. Mr Grant said it was great to see all the younger members, the future of the SES. Special guests on the night included Mitchell Federal MP Alex Hawke, Castle Hill MP Ray Williams and Berowra Federal MP Julian Leeser. “Congratulations to the many volunteers who make up the unit – every hour you give of your own time to our community contributes to making a real and very valuable difference to people’s lives.